Over the years we've found that many of our clients & friends want to participate in one of our trips but the dates we've scheduled just don't work for them or they'd like a customized trip for their family or friends. Rather than mass produce trips for every date we've instead started to offer custom safaris for groups so that we can provide the same high-level of personal attention, guiding and instruction adapted to your schedule and dates. Custom trips are a great way to allow children, spouses or other non-photographer family members to all enjoy a great trip that matches your personal schedule and interests. They can also be a great way to explore incredible destinations like Namibia that are we can't normally offer on a regular basis. Contact us at safaris [at] cardinalphoto.com or +1.650.851.8350 to get started on your photo adventure of a lifetime. African Wildlife: World's best wildlife safaris, bar none. Definitely the adventure of a lifetime. You can see our scheduled Botswana Wildlife Photo Safari to get some idea of the possibilities. Additional sites like the Khalahari Desert (Bushmen, Meerkats, Zebra migration, Flamingos) and Victoria Falls are always an option, as well as Namibia (the Namib desert, the Skeleton Coast, Etosha and Damaraland are all favorites). 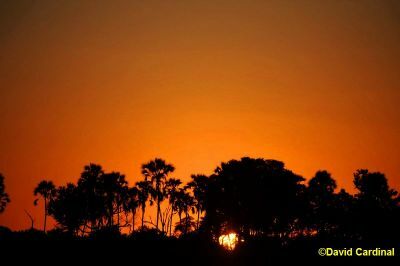 Image: Okavango Sunset from one of our Botswana Safaris. 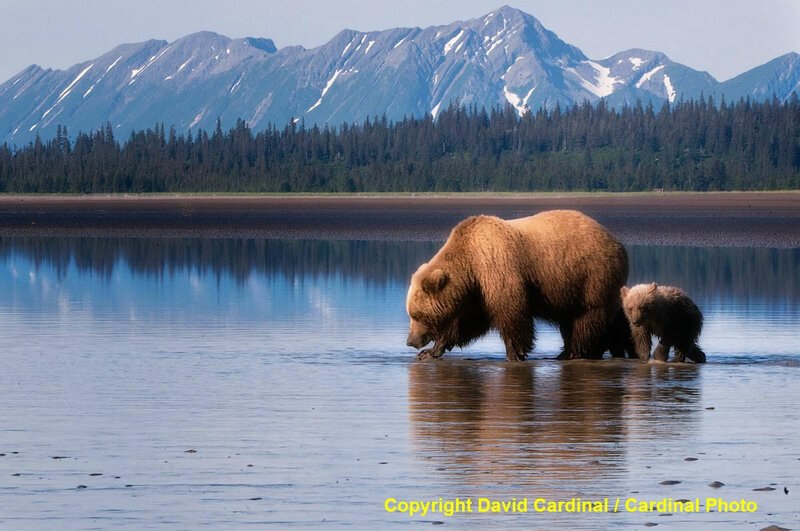 Alaska: We work with the world's best Grizzly Bear viewing & photography location, but we'll also have plenty of chances to see birds including Bald Eagles, Horned and Tufted Puffins, and other shore and sea birds. Kayaking, clamming, world-class salmon and halibut fishing as well as hiking and just plain sightseeing in the midst of beautiful mountains are all great activities everyone can participate in. For examples of some of the opportunities you can see the description of our scheduled Alaska Grizzly Bear & Puffin Photo Safari. 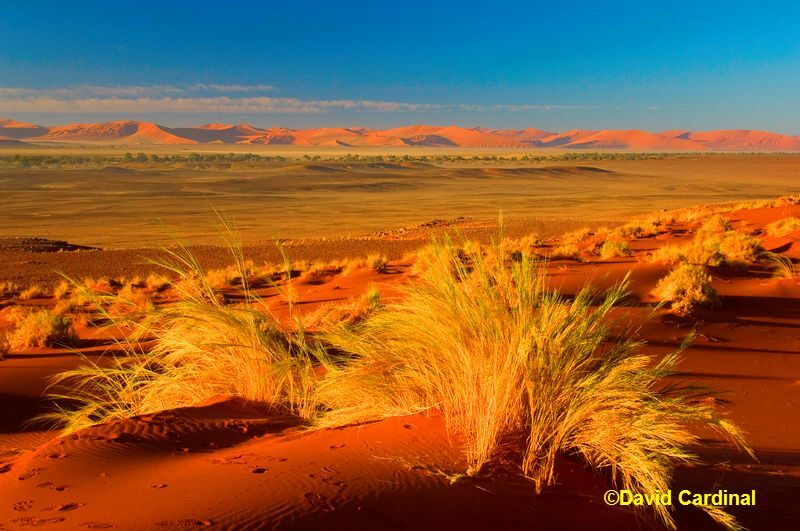 Namibia: More exotic than even Botswana, with the world's most haunting and photogenic red sand dunes (Namib Desert) as well as it's most isolated desert and coastal environments (Skeleton Coast). A variety of wildlife can also be seen including the very rare Desert Elephant and Desert-adapted Elephants. Namibia also features some of the most colorful tribal groups on the planet including the famous Himba we can visit while we are in Northern Namibia. Southeast Asia: Cambodia, Burma (Myanmar), Laos and Thailand: There are nearly limitless sightseeing opportunities in all these countries. We tend to focus on Cambodia and Burma (Myanmar) because they are less traveled than Thailand, but depending on your interests and experiences there are a variety of possible itineraries with a mix of historic and cultural sights as well as village and other ethnic life experiences to be had. To get a sample of our scheduled trip you can see our Southeast Asia Photo Safari description. 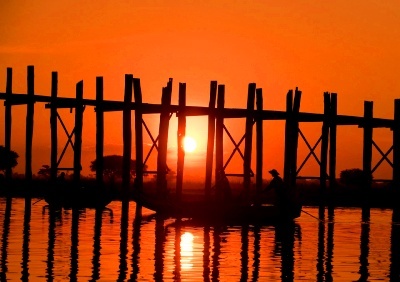 Image: U Bein Bridge at Sunset near Mandalay, Burma from one of our Asian Safaris.